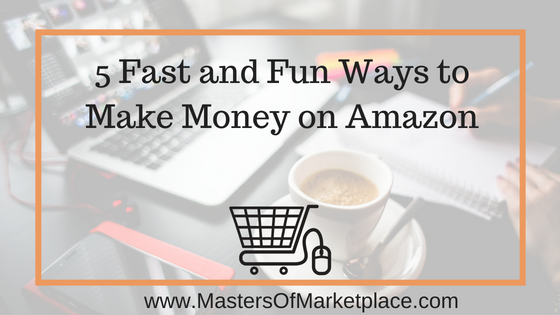 Did you know that there are multiple different ways to make money on Amazon? If you’re anything like the average Amazon customer, you go there for just about everything. I know I do. Baby clothes, diapers, dog food, household items, books, movies, you name…I’ve bought it. Plus, who wants to bring their kids to the store and have to say no over and over again every time they want to buy something. I personally cannot take my daughter anywhere that sells Disney related items (which is basically everywhere…Target, Walmart, Walgreens, etc.) without caving and letting her buy one new Minnie Mouse themed item. As a result, we have what seems like a million Minnie dolls, bags, clothing items and more in our house. So instead of only SPENDING money on Amazon, from now on make a promise to yourself that you’ll start getting Amazon to pay YOU instead. I’ve sold multiple millions of dollars of items on Amazon. Commissions I made from managing an Amazon store for a supplement company is how I paid down $75,000 in debt from school loans in only 3 short years. So yeah, there’s a LOT of money to be made on Amazon. Here are the top 5 ways Amazon can pay YOU instead of the other way around. One of the most popular ways to make money on Amazon is through selling on their enormous seller marketplace. There are thousands of different sellers selling millions of different products. You can sell everything from books, to electronics, to kitchen items and everything in between. They even allow both customizable products and handmade items, too. Do you sell on Etsy? Bring your products over to Amazon and easily create another income stream for your business by selling what you already have for sale. Plus, Amazon offers their own fulfillment services so you don’t even need to ship the items yourself if you don’t want to. You can send your products directly to Amazon warehouses and they’ll take care of shipping to each customer after they purchase. Plus, Amazon offers free shipping to all Prime Members. So if you use their fulfillment services (they called it FBA – Fulfillment By Amazon) to sell your products, anyone with a Prime membership can get shipping for free. This is a great way to entice more customers to buy from you. Did you know that the average Prime member spends $1,500 per year on products from Amazon? So why not take advantage of this? Get your products listed on Amazon, sit back and let the 244 million daily Amazon users come and find you. Amazon is a huge online marketplace that allows just about anyone to sell products. There are so many different categories in which you can list your items. Even if you don’t have products to sell now, but would like to find something to sell in the future, check out their list of categories for some great ideas on how to get started. 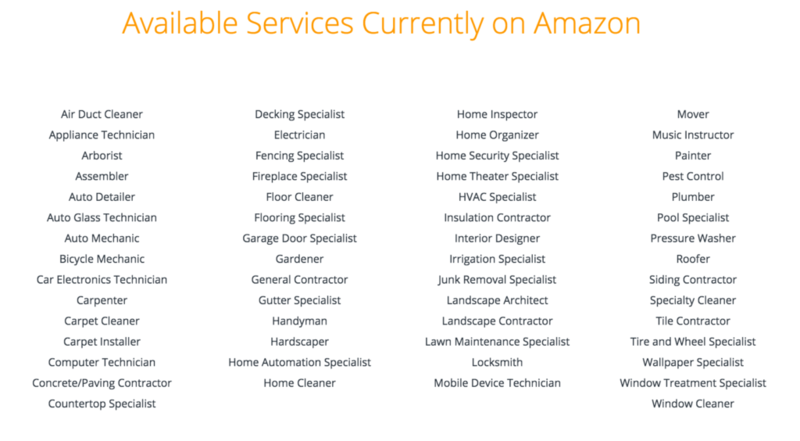 Amazon now allows you to sell your services on their site. For many, many years they only offered physical and digital products. They’ve now opened up to a HUGE new market of service based professionals who want to make money on Amazon. If so, sign up to let Amazon do your marketing for you. Are you a blogger? Do you have a blog where you can promote products you use and love? Then I highly recommend you sign up for an Amazon Associates account to make money on Amazon. Amazon pays you 4-12% (based on performance) of the revenue generated from your sales. This means that you can potentially earn hundreds or even thousands of dollars per month in PASSIVE INCOME just by talking about products you use and love on your website. Write a blog post about a certain toy your toddler loves and insert your affiliate link where your readers can purchase the toy. Or craft a book review of the latest novel you’ve read and include the link where readers can go buy once you’ve convinced them how good the book is. Note that you MUST have an affiliate disclosure statement on your website so readers are aware that you will earn a commission if they buy through your links. Also, I HIGHLY recommend you only promote products that you use and LOVE. Your audience trusts you and you don’t want to betray that trust by promoting something you’ve never used just to make a quick buck. Do you sell any ebooks in your business? Bring them over to the Amazon platform and watch your sales skyrocket. Have you always wanted to become an author? Amazon makes it incredibly easy to self publish on their site. Why not put the content you’re already creating out there in front of the millions of Amazon users who are already looking for it? This is a unique way to make money on Amazon. After you register as an Amazon Turk worker, you can choose from hundreds of “HITS” or Human Intelligence Tasks that allow you to perform simple tasks for money. I’ve sign up for and completed HITs on Amazon Turk. The tasks are fairly easy and while you’re certainly not going to earn millions of dollars working on this platform, you can still bring home some nice extra spending cash. Don’t get left behind chasing after the Amazon train. Hop on board and start earning money through Amazon.com today.